Let me introduce myself. My name is Pippy Longstalker. My number is 36 and I skate for the Dominion Derby Girls. Roller derby has evolved and has become very organized with rules and regulations. But, it is a full contact sport that requires agility, skill, teamwork, and most of all, confidence in yourself. I have been skating since February 2009 and have loved every minute of it. The Dominion Derby Girls is an all-female flat track roller derby league formed with the purpose of promoting the sport of roller derby and giving back to the community. We follow all rules and regulations of the Women’s Flat Track Derby Association and are very proud members of the WFTDA. Above all, we are an amateur athletic organization, priding itself on the strength and diversity of its all-female skaters. As such, we have a rigorous training and practice schedule that enables to participate in national competition. 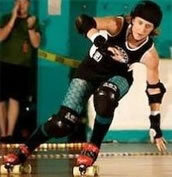 My interest in roller derby began in Portland, Oregon, with the Rose City Rollers. My sister was looking for an athletic-, social-, and community-oriented organization and started learning how to skate in 2005. That fall, I relocated to Arlington, Virginia, outside of Washington, D.C.. Once I was settled into the fast-pace lifestyle of Northern Virginia, I started looking for a similar outlet. Family was 3,000 miles away and running on a treadmill and going to a gym was starting to become monotonous. I had heard that D.C. had a roller derby league and a co-worker and I started looking into joining. But, after seeing that the practice facility was an hour outside of town (in good D.C. traffic) and after figuring in my work schedule, I wasn’t able to commit. Fast forward to the fall of 2007 and a relocation three and a half hours south to Norfolk, Virginia. Again, that feeling of being lost and alone overwhelmed me. I dove into my career and spent as much time running and working out as I could. But, I still felt dissatisfied with my life. Something was missing. The team atmosphere that I had grown up with wasn’t there. I was a Division 1 softball player in college and have been involved in athletics my entire life. Team sports are part of who I am. However, upon graduating, I realized that outside of a few community leagues there aren’t many competitive opportunities available for a former female athlete. I was looking for a team that would push my physical and mental abilities and fill that void that was quite prominent in my life. So, after a year of soul-searching I did a little Internet searching and voila! The Dominion Derby Girls were recruiting!!! I shot a quick introductory email to the Fresh Meat Committee and found out when practices were. I went and watched a practice and immediately fell in love. Women of every variation—size, age, career, race, and sexual orientation—were out on the rink skating their hearts out! They were smiling! They were sweating! Most of all, they were a team. I immediately ran to the local sports store and bought my protective gear and skates. I couldn’t wait for the next morning and my first practice as a derby girl! Let me just say that my first practice was not pretty. My skating skills were probably about as good as Bambi on ice. But, the coaches were great! They taught me the necessary skills and I started to become more and more confident on 8 wheels! My very first bout was incredible. The feeling of nervousness mixed with excitement was overwhelming! After donning my uniform and my pigtail braids, I grabbed my gear and headed off not knowing what was in store for me. Warming up, I felt the nerves begin to grow. The other team wasn’t intimidating–it was the unnerving doubt in my abilities and the fear of letting me teammates down. But, before I knew it, introductions had started and the announcers were calling my name. “Number 36 AA, PIPPPPPYYYY LOOOOOONGSTALKER!” Oh no! What do I do? I quickly raised my arms and blew a kiss to the crowd with the biggest grin on my face. This is it! My first bout! My debut as a Dominion Derby Girl! And then, the whistles blew and the skating started. The first half went by quickly. What happened in that first period is all a blur. Half time came and went and the second period was starting already! A sense of determination came over me. I was not going to let my teammates down. I was not going to use my inexperience as an excuse. This was a new period and a chance of redemption. My name was called in the lineup and out I went. Lining up on the inside behind my pivot, The Ruffian, I looked around me and realized that the opposing team wasn’t any different from me. They weren’t any better than me. We all had 8 wheels strapped to our feet and I wasn’t going to let a little bit of nerves get in my way. And then, the whistles blew. Off we went. All I could think was “Stay together. Hold the line. Hit them HARD!” Then, it happened. Their jammer was coming through the pack! I pushed off and skated straight into the path I knew she would take and WHACK! My shoulder went straight into her chest. Take that! That’s right! A newbie just knocked you down! A wave of confidence and pride came over me. I did it! It doesn’t matter how good another skater is as long as I remember what my coaches have been teaching me and I put it to use. I can succeed at this sport! I can help my team! The rest of the period played out and it was over too soon, but I will never forget that first hit. Every bout I skate in, I remember that rush of adrenaline and emotion that flooded over me. Now, less than a year after stepping out onto the rink with unsteady feet, I have filled that empty void in my life. My teammates are my new family. My skates have propelled me into a world that I could never have imagined existing. When I step up to the jammer line at a bout, I am transformed into a fearless woman with confidence and agility that I never thought I’d possess. I am a stronger woman because of roller derby, not just physically, but emotionally and mentally. Laura Madson was born in Bremerton, Washington, and has lived in Venice, Italy, upstate New York, Portland, Oregon, and many more places–she wants to see as many places as possible! She currently resides in Portsmouth, Virginia. 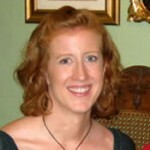 Laura earned her Bachelor’s degree in music but is now a veterinary nurse. She has two dogs, Roxy and Abigail, and one cat, Gracie Growleypants. Things that tickle her fancy are good-hearted people who try to make the world a better place, ice cream any time of the day, and trying new things.